Consider first, that the Christian religion is in the nature of a religious order or institute, founded by Jesus Christ our Lord, and taking its name from him. The Son of God himself came down from heaven to be the founder of the Christian order. Its origin is heavenly; its rule is heavenly; being God's own word and the gospel of his Son. Its tendency is heavenly: it tends to deliver us from all those evils, both with regard to time and eternity, in which we are unhappily involved by our first parents' transgression, particularly from the death of sin, and from the second death of hell - and to bring us to our sovereign good, to all perfection and sanctity here, and to our true and eternal life hereafter. The means it furnishes us with for this end are also heavenly: such as the communications of divine grace; the sacred mysteries and sacraments, of divine institution: the daily conversation of God by prayer, and the communion of the saints, or a happy association with all holy persons in all holy things. The Christian makes his solemn religious profession at the foot of the altar, at his baptism; there he engages himself by vows to renounce the world, the flesh, and the devil, and to lead an innocent and saintly life; there he receives for his habit the white robe, denoting cleanness of heart and innocence, with a charge to keep it all his lifetime without spot or stain; there he puts on Jesus Christ, by a new birth, in order to a new and spiritual life, that he may know no death. O! can anything then be more holy than the sacred institute of the Christian order; where the founder, the rule, the exercises, the vows, the habit, and the whole manner of life that it requires are all most heavenly and divine! Consider 2ndly, the blindness and misery of the greatest part of Christians, who live in a strange insensibility of the excellence of the Christian religion, of the obligations of it, and the sanctity it requires of them, in consequence of the alliance it gives them with the whole blessed Trinity. The dignity of a Christian is indeed very great. He has the honour to be enrolled in the service of the great king. He is made his domestic, his friend, his favourite. But this is not all; he is even adopted, through Jesus Christ, to be a child of God, and an heir of his eternal kingdom: he is ingrafted and incorporated with Christ, and made a member of that mystical body, of which the Son of God is the head; he is made a partaker of his spirit; of his kingdom and priestly unction, and in some measure of his divine nature. The grace of Christianity is so great that the apostle, writing to the Ephesians, seem to want words to express it. He calls it 'the unsearchable riches of Christ, and the mystery hidden from eternity in God,' Eph. iv. 8, 9, with a great deal more to the like purpose, as well with relation to the exceeding great goodness of God, manifested in his calling us, without any desert of ours, to so great a grace as this of the Christian religion, as also with regard to the incomprehensible advantage which this grace entitles us to. But oh! may we not too justly apply to the greatest part of those who are called to all these advantages that of the royal prophet, Ps. xlviii. 21, 'Man when he was in honour did not understand; he hath been compared to senseless beasts, and made like to them.' Alas! this seems to be the case of millions of Christians. 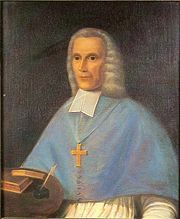 Consider 3rdly, that our eternal welfare absolutely depends upon our living up to the character of a Christian, and to the duties and obligations of the Christian religion, in particular those we have taken upon us by our baptismal vows, and which are insisted upon as essential, by our holy rule and founder. These are all reduced into a small compass, in those words of the psalmist: 'Turn away from evil, and do good.' This is a short abstract of the whole duty of a Christian. The first part requires a settled determination of the soul never to commit a wilful sin for any consideration whatsoever, no not even if life itself were at stake. The second part requires a constant attention to do the will of God in all things, and to advance every day in the love of God. Do this, my soul, and thou shalt be a Christian indeed; persevere in this until death, and thou shalt receive the crown of eternal life. Conclude henceforward to have always before thy eyes both the dignity and the sanctity of the character of a Christian, and to show it forth in thy life, lest otherwise it rise in judgment against thee, and prove thy greater condemnation on that day when thou shalt be called upon to give an account of thy stewardship.